I have been in contact with the United Nations High Commission for Blanket Raffles, which has declared that all is in readiness to raffle American Blanket No. 1. Those aspiring to own this patchwork salute to Kaffe Fassett and the Ancient Art of the ZigZag should buy their tickets by noon (New York time) on Saturday. The drawing will be held later in the weekend, and the winner will be notified and announced on Monday or Tuesday. depending on how fast the carrier pigeons can make the transatlantic crossing. The light has been dimmed by fog for the past two days, so I have yet to take my Cecil B. DeMille shots of the blanket. I did go to Brooklyn on Monday to show the finished work to Amber, who made such a heroic late-third-trimester effort with the layout, and had the idea of doing the inner borders as chromatic strips (to set off the zig-zag, and because we like chromatic strips). I introduced little Benedict to distressed denim. Raise ’em right! Wow, that blanket is awesome. I wish I had ever knit a sock so I could have contributed more than my cheers (okay, and my money, I still hope I win). It is beautiful, as for the babies, they are SO much fun when you can borrow them and give them back too when they get to be a bother!!!! Oh – I’m torn between which I would rather have: the blanket or Benedict! Is Michaela selling tickets for both? ps: is the baby’s name a tribute to the Pope? And exactly how sick of hearing that question is Amber? That blanket is stunning! You and Raspy look darn good too. The blanket is coloriously fabulous. Every time I see that blanket, it makes me so happy! It is gorgeous! Now I *really* want that blanket. The chromatic strips make it super special. The blanket is stunning! Although I admit to feeling just a bit faint at the thought of all the sewing up and applied I-cord involved. And Benedict is adorable! Glad to see you’re introducing him to good things already. The artistry displayed by you and Amber and Michaela in creating these gorgeous blankets out of completely random squares is stunning. Really stunning. Oh that blanket!! Oh that baby! !So with you on the epitaph. I’m overwhelmed by the beauty of the blanket. I mean, I knew it was going to be good, but still. Oh and I’m glad to see you’re practicing with Benedict. My babe’s gonna be here sooner than you think and DUDE. I may be living with you. Benedict ain’t got nothin’ to do with the pope. While considering the name, I had actually forgotten that Cardinal Ratzinger had taken it as his pope name (someone else chime in the with real Catholic term for “nom de pope”, eh?). I still think of him as Cardinal Ratzinger. Dude, more babies is right. Even now, on week 5 of little sleep and many diapers, I repeat what I said on the operating table getting a c-section (totally undesired but necessary in the end), gotta do this at least 6 more times. I would just add that tiny Benedict was precociously papal in his infallible control over his household. He’s going to be the Pope of the B Train. Oh, my! The finished blanket is even more beautiful than I imagined. Everyone did a wonderful job! I love the blanket! What size bed is that? It looks like it may be queen-sized. Doesn’t really matter — it would look wonderful on our king-sized mattress. Now, to click links! I might have to buy a ticket after all! The blanket is really very incredibly beautiful. 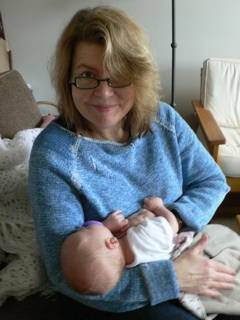 And the baby… I want one too! That is fabulous! So is that baby! come on down to st. pete, FL. I’ve got 2 babies who need holding, and a 2.5 year old who loves attention. WOW! that blanket…WOW!!!!!!!!!!! It’s stunning! Well done to all who did the bits and pieces and to those who stitched up tose bits and pieces!!! grrrrrrrrrr I meant….’THOSE’ bits and pieces!!! w00t!!! Oh, what a beautiful blannnnketttt…oh what a beautiful dayyyyyyyyy, I’ve got a beautiful feeeeeeelinnnnnnn…. Sorry. I lost myself there for a minute. any word from Ann? I hope her and her family are safe. The news is scary and she must have been in the thick of it. Let us know if she’s okay, though I would gather power must be out in her area. The blanket is so terrific. Kay, you look great holding beautiful Benedict. Beautiful blanket, beautiful baby and a horrible horrible tombstone. this beauty, let me know. Just bought my raffle tickies! Now, you DID get my bribe to fix the raffle in my favor, right Kay? I will look forward the the email telling me that I have won that wonderful blanket! OMG! Love that blanket and what a sweet baby! Most excellent blanket layout and most excellent cute baby. But at first glance I thought you were breast feeding him. Probably not, eh? Smashing blanket! You did an amazing job with the borders. It made all the difference. You know I looovve the blanket! And I agree, Kati, the borders make all the difference. I, too, like the fusion of knitting and quilting. But now I sense that the (“the”) chickens are restless. Could it be that they’re fixin’ to nest on the bee-you-tee-ful blankie?? 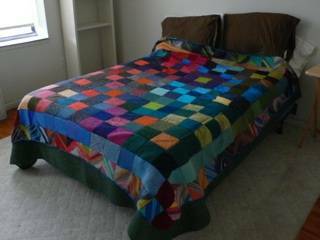 The blanket looks wonderful–much bigger than I had imagined. I just purchased my raffle tickets, and I must issue a warning to the others: I have won charity raffles before, and I’m feeling lucky, so if you want a better chance of beating me out of the blanket, buy more raffle tickets! Note to Kay: Don’t mourn the fact that you didn’t have more babies. In a few short years your children will make you a grandmother, and your grandchildren are ever so much more delightful and fun to be with than your own children! That blanket is stunning (even in low light!). Um…that certainly won’t be MY headstone! Dang that is HUGE! Wow! Now I am inspired. Wow! I love that we all came together to make this (I would never have had the fortitude for all that finishing). It is gorgeous! How will I ever thank everyone enough ? Everyone who has knitted squares and bought raffle tickets. Michaela for having a generous spark of an idea, and starting this off. Kay for the thought, design and love that she has put into this blanket, and the miles of i-cord she has attached ! THABK TOU, THANK YOU, THANK YOU ! babies are positively the BEST!!! Really fabulous blanket. Nobody can afford this much handknitting. I hope it generates tons for Olivers chair.